The Central Ground Water Board has found the presence of arsenic matter beyond the permissible limit in water samples drawn randomly from some hand pumps in certain villages in the state. Even a conservative estimate will put the food grain storage losses between two to five per cent in Punjab. In a state where 200 lakh tonne of food grains are procured annually, storage losses even at this rate become substantial. The food so lost could have been used for feeding thousands of families all year round. Strong resentment prevails among officials of the state Excise and Taxation Department against Minister for Jails and Tourism Hira Singh Gabria for allegedly reprimanding them for unearthing a scam of fake billing involving a huge sum of Rs 10,000 crore in which traders have allegedly taken a refund of VAT. Cotton on around 9,500-acre land in the Malwa belt has been damaged by the floods, of which 2,000 acres of cotton crop has been affected in Faridkot district alone. This border village is different from all other villages of Punjab, as it had not only remained under control of Pakistan for some days during 1965 and 1971 Indo-Pak wars, but also its people were forced to bear the pain of abandoning their homes and hearth here and relocate themselves in nearby Kakkar Kalan village due to heavy shelling in the 1971 war. The growth of hyacinth in the Harike, built on the Beas and Sutlej, has started posing a threat to the 1953-built Harike headworks. The water weed has engulfed water in a large part of the water body, particularly near the headworks. Sources in the Punjab Irrigation Department said the weed had grown to an extent that it could seriously damage the headworks. As many as 13 students of the local Hindu Girls Senior Secondary School suffered multiple injuries when the roofs of two classrooms, one on the first floor and the other on the ground floor,caved in due to heavy rain here today. Candidates from the English, Science, Social Studies and Math streams are not being given appointment to posts of education service provider despite vacancies. In a first ever initiative of its kind, the Dental Council of India (DCI) had launched a nationwide survey to ascertain the availability of dental manpower in the country, said Dr SPS Sodhi, newly co-opted executive member of the DCI. The tussle between doctors and pharmacist serving in rural dispensaries across the state has intensified with representatives of the Rural Medical Services Association (RMSA) today strongly condemning the pharmacist for accusing them of cheating them monetarily. The arrest of two persons for allegedly making fake police verification certificates has opened a Pandora’s box, besides indicating that the gang’s operations extended to even Himachal Pradesh. Major hurdles coming in the way of expeditious completion of the Rs 2,750-crore project of the six-laning of the Panipat-Jalandhar national highway were sorted out today as Deputy Chief Minister Sukhbir Singh Badal today called on Birjeshwar Singh, chairman of the National Highway Authority of India (NHAI), in New Delhi. Residents of Uppal Bhopa village are awaiting the remains of Pooran Singh, whose ashes were brought back by legendary cricketer Kapil Dev today. The court of Additional Sessions Judge, Ropar, Surinder Mohan today granted bail to Russian national Olga Timoshik, who was arrested for being an accomplice of German spy Thomas Kuhn. The court granted bail to Olga on two sureties of Rs 1 lakh each. She was directed to submit her passport to the police, not to leave the country and cooperate in the investigation. The State of Punjab has cancelled “scores of transfers” ordered by the “retiring director, Health and Family Welfare”; and is examining “whether the transfers are in administrative exigency or not”. The CIA staff of the Sangrur police arrested two persons with fake currency of Rs 15,00,000 from Mehlan Chowk here. The board, which tested the samples at its lab in Chandigarh, has confirmed the presence of arsenic matter in its report that is to be submitted to the Union Government soon. The level of arsenic matter in the water is so high that people need to be be told to stop drawing water from these hand pumps. “Such pumps should be sealed immediately,” said an official of the board. The permissible limit of arsenic in drinking water is 0.01 mg per litre. However, at a hand pump installed at a bus stand at Bhamme Kalan, near Mansa, the arsenic level in the water drawn from that pump was found to be 0.2080 mg per litre, which is very high. “ No one should drink water from that pump,” said the official. The arsenic level in the water of a submersible pump owned by Roop Ram at Dhaipi, near Cheema Mandi (Sangrur), was found to be 0.207 mg per litre, beyond permissible limit. “As an alarming level of arsenic matter has been found in some shallow hand pumps, we will go in for an extensive study in this regard in the entire state,” said a board official. The reckless use of pesticides seems to be the reason for such a high level of arsenic matter in shallow hand pumps. On instructions from Union Water Resources Minister Pawan Bansal, a team of scientists of the board had collected 105 samples of water drawn from hand pumps, tubewells and submersible pumps. Ram Pal Dhaipi, general secretary of the Punjab unit of the Congress, had approached Bansal for getting the water samples tested. Dhaipi has been active in the Malwa belt, taking up the cause of people suffering from cancer. The level of arsenic matter in water drawn from a hand pump owned by a farmer, Harmesh Singh, at Meerpur Dhani, near Sardulgarh, has been found to be 0.0163 mg. At Ghari Bhaggi, the level in water from a hand punp owned by Sukhdev Singh, a panch, has been found to be 0.147 mg per litre. Likewise, the level of arsenic matter in water from hand pumps at Nandgarh and Kotra Kalan have also been found the beyond permissible limit. “Emphasis is not on scientific storage,” admits an old-timer in the food trade. “Though all agencies, both state and central, claim to be using most scientific practices in food storage, the reality is they are most medieval. These agencies try to save pennies but loose in pound sterlings,” he quips. “Why the state agencies are reluctant to go for silos?” he asks. Changing bags from jute to plastic or graduating from simple plinths to covered area plinths are only cosmetic advances that are far from adequate for safe and scientific storage. “Grains must breathe and remain dry,” he adds. More than 80 per cent of the grains in Punjab godowns lie in "plastic bags". Seventy per cent of total food grains lie covered with plastic sheets for protection from the vagaries of weather. Sita Ram Meena, the manager of FCI’s Bathinda food storage depot, says the capacity of the depot is 29,810 metric tonne (MT), of which 17,510 metric tonne (MTs) lies stored in eight big sheds. The remaining 12,300 MT of food grains (wheat) is stored in the open. FCI official Palvinder Singh claims there would be no shortage of godowns from next year as new godowns would be available. In Malerkotla, food storage is worse because of the flooding of the godown area. In Barnala, bags carrying wheat at FCI godown at NGM Marg lie torn. The FCI district manager at Patiala, AK Gupta, says they have 8.32 lakh MT of rice stacked in various godowns in the district and 51,000 MT of wheat lying in open spaces. In Amritsar, the FCI has 12 godowns with covered storage capacity of 1,42,949 MT and 48,565 MT covered area plinth (CAP). However, the FCI employees had to put in extra efforts to protect the wheat lying under tarpaulin sheets. At Jandiala, it was noticed that one lot of wheat did not have tarpaulin cover at all. Satnam Singh, officiating area manager of FCI, said the tarpaulin might have been removed for some work. He said in the FCI they followed stringent international standards of storage. Sandeep Sangla, district manager of FCI in Ferozepur, says 14 lakh MT of wheat belonging to various procurement agencies, including the FCI, lies stacked in different godowns and the entire stock of wheat is safe so far. Officials of the state Excise and Taxation Department officials in Ludhiana have busted a racket of alleged fake billing in which bigwigs of the iron and steel industry of Ludhiana, Fatehgarh Sahib, Patiala and Jaladhar are involved. The department has lodged FIRs against 13 such persons and issued notices to 500 traders. This has upset bigwigs involved in the alleged scam, who have sought intervention of political bosses. Gabria held a meeting with officials of the department yesterday and asked them to keep away from the alleged defaulters. The officials alleged that the minister snubbed them in the presence of the defaulters. However, Gabria denied having used any harsh word. The minister said he simply told them that no harassment should be caused to traders. Deputy Excise and Taxation Commissioner Parampal Singh said today that the racket basically pertained to the misappropriation of VAT and department officials were investigating the issue. There was a consortium, which indulged in this clandestine business and allegedly made use of ITC (input tax credit) facility available to them. It is learnt that the minister took exception to the charge of 120- B, IPC, along with Sections 420, 467 and 471 (cheating and forgery) of the IPC. The contention of Excise and Taxation Department officials was that it was the job of the police to decide to book defaulters under which section of the IPC and they were not concerned about Section 120-B of the IPC. They had referred the matter to the police for investigation and prosecution. Police Commissioner Ishwar Singh said the defaulters had been booked under Section 120-B of the IPC because there was a group of people involved in the scam and it smacked of a conspiracy of evading and misappropriating VAT and other taxes. He confirmed that 13 FIRs had been registered and the matter was being investigated by Additional Deputy Commissioners of Police - Harsh Bansal and Jaswinder Singh Sidhu. State Excise and Taxation Coommissoner Venu Prasad said no harassment was being caused and officials were doing their duty according to the law. “We will continue to discharge our duty without any pressure,” he added. Deputy Cheif Minister Sukhbir Singh Badal had directed officials of the Excise and Taxation Department to not to spare any tax evader and take strong action against them. He had transferred many officials from tax barriers to ensure the proper recovery of tax. Following this, there had been 30 per cent increase in the collection of tax during the first quarter of 2010-2011, said Prasad. “ We plan to collect Rs 10,000 crore VAT this year against Rs 8,250 crore of 2009-2010”, he added. Blaming the state for the loss, farmers alleged that the Drainage Department had not cleaned the drains of the rural areas that had resulted in the floods. The cotton crop has grown in Faridkot, Moga, Mansa, Ferozepur, Sangrur and Bathinda districts. Rains have mainly affected this crop in Mansa, Sangrur, Ferozepur and Faridkot district. In Faridkot district, reports of affected crop have come from Tehna, Kameana, Veerewala, Nanagla, Chameli, Mandwala, Dhurkot, Jeewanwala, Aulakh and nearby villages. An official of the Agriculture Department said cotton grown in low-lying areas had been affected due to water logging. Cotton normally requires less water as compared to other crops. Rains today have further spoiled the crop in some areas, however, exact loss was not known yet. “There can be an outbreak of some pest attacks due to high humidity as well,” the officer said. Meanwhile, Punjab Agricultural University (PAU), Ludhiana, has released a flash message asking the farmers to spray Cobalt Chloride in the affected areas of cotton crop. “Due to water logging in the fields, the crop tends to wilt and this spray would help regain the turgidity of the cotton plants,” scientists at PAU said. The farmers of the cotton belt area have demanded an appropriate compensation as most of them grow Bt Cotton, the seed of which is expensive and it is not easy to sow this crop again, a farmer of Faridkot district said. And in a welcome announcement for the revenue staff, he said the government would soon give promotions to the department staff as well as make new appointments. Punjab government, said he, was working expeditiously to set up computerised land record centres across the state by the end of this year, which would facilitate easy access to land records. Once these centres were in place, the common man would be able to get the records of their land within a few hours, a task for which they earlier had to run from pillar to post, the Minister said. “This will ensure transparency in land deals, help farmers in getting loans from banks more easily, mean lesser margin of error in land records and lessen the burden of patwaris and kanungos,” he said. Besides, the ‘inteqal’ (mutation) of land will also be done at these centres without any ‘mukhtiarnama’. Even the tehsildars will be able to solve disputes regarding mutation and other land documents within two months, he said. Kohar claimed that from next year onwards farmers would be provided 12 hours of power supply, instead of eight hours being given presently. On the occasion, the district administration officials said out of 83 villages under Anandpur Sahib division, the land records of 33 villages had been completely computerised while the rest were likely to complete by August 15. Prominent among those present during the inauguration were MLA Sant Ajit Singh, DC AS Miglani and SDM APS Sandhu. Eighty-odd houses in the village were destroyed in the heavy shelling during the war, but interestingly no damage was caused to gurdwara Baba Ran Singh. More amazing was the fact that none of the villagers got killed or injured in the cross-fire as all of them safely evacuated the place. The small yellow-coloured building of the shrine was the lone building, which still registers its towering presence here amid mounds of ruins of war-ravaged houses. 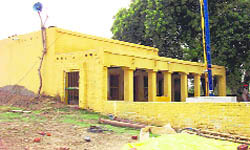 The old gurdwara building was being preserved by a group of dedicated Nihang Singhs doing kar sewa at the place and by a few members of the Dashmesh Tarna Dal, who, along with the villagers, believe that only the God could have acted as a saviour for the residents and the shrine building. Memories of war and destruction are still afresh in minds of some old people, who recounted that the village had remained under control of the Pakistani army for six and 18 days during the 1965 and 1971 wars, respectively. “It was a rain of mortar shells on both the occasions and the village had turned out to be a battleground for the armies of the two countries. Though we had managed to shift to a safer place in Kakkar Kalan village, which worked as a temporary line of control for some days, our cattle perished in the shelling,” said 80-year-old Bagga Singh. Ranian village, according to Bagga Singh, had got divided into three hamlets that were re-established by the residents about half a km away from the original site of Ranian village. DC Kahan Singh Pannu said the village had the unique history of remaining under control of Pakistan for some time. Now, the re-settled and re-shaped Ranian village has a primary school, even as the kids of some well-to-do farmers can afford to study in English medium schools in Ajnala. The village has more than 200 acres of land across the barbed wire, due to which the farmers face a lot of difficulties largely owing to strict control of the BSF authorities. “We are allowed to tend our farms only between 9 am and 4 pm across the fencing. Moreover, hardly any relatives can afford to visit us, as they are subjected to questioning by the BSF officials at the nearby BSF post,” rued a farmer. “People of the area are driven by a wave of strong faith. They converge here to pay their obeisance once in a month,” said Baba Amar Singh, Jaspal Singh and Balkar Singh at gurdwara Baba Ran Singh. The growth of hyacinth in the Harike, built on the Beas and Sutlej, has started posing a threat to the 1953-built Harike headworks. The water weed has engulfed water in a large part of the water body, particularly near the headworks. 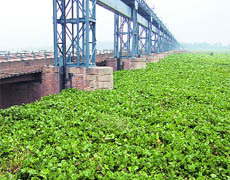 Sources in the Punjab Irrigation Department said the weed had grown to an extent that it could seriously damage the headworks. The water weed had posed the same threat about 10 years ago when the state had to seek Army’s help to remove it. Employees at the headworks said huge chunks of the weed had started floating around suddenly during the last week. The growth was so rapid that it had covered almost all parts of the 31 gates beneath the 2,087-ft bridge, said Sohan Singh, a farmer. A road safety missionary, Jagir Singh Sandhu, said the water hyasinth might prove to be a threat to the bridge. He further said besides causing losses worth crores, the water hyasinth might disconnect this part from other parts of the country for years. Harike was built at a point on the Beas and the Sutlej from where the canal water goes to Rajasthan and other parts of the country. The injured students were shifted to the Civil Hospital immediately after the mishap took place about half an hour before the school was to close at 2 pm. Harbans Singh Mutti, district education officer, said the building safety certificate was issued to the school authorities by the Public Works Department in 2009-10. Civil Hospital sources said all injured girls were out of danger. Information gathered by TNS revealed that first the front portion of a classroom on the first floor, where students of Class IX were present, caved in and it hit the roof of the room on the ground floor, where students of Class X were present, and made its roof cave in.The school is among the oldest in the region. The injured students were identified as Swaran, Salma, Priya, Meenakashi, Monika, Shikha, Asha, Rajwinder, Neha, Asha, Baljinder and Harpreet. K K Yadav, Deputy Commissioner, said a panel comprising engineers of the PWD would inspect the school before the authorities were allowed to hold classes on the premises. Saroj Shegal, principal of the school, said a major tragedy was averted as she along with other teachers managed to evacuate students from these classes. The service providers (a euphemism for contractual teachers) said the Education Department had advertised 4,000 such posts in August 2007. It said 10 per cent candidates were put on the waiting list, of which the candidates from Punjabi, Hindi, and Physical Education were appointed in August and October 2009. The Education Service Providers Association leader, Sandeep Sharma, said despite vacancies in the subjects of English, Science, Social Studies and Math, the department was not appointing those on the waiting list. Sharma said on July 8, the Director General School Education (DGSE), wrote to the DPI Elementary Education, to fill the vacant posts of teachers. He said the same should be done in the case of education service providers. Sharma said the waiting list candidates in the service provider’s category were qualified and trained teachers presently teaching in reputed private schools and colleges. He said they were suffering because of casual attitude of education officers. The association appealed to Education Minister Dr Upinderjit Kaur to fill all vacant posts immediately. Sodhi said the DCI had also made it mandatory for both government and private dental colleges to introduce biometric attendance system in institutes. He said in the recent years, new dental colleges had come up, which had eventually led to an acute shortage of manpower. He claimed that the recent initiatives mooted by the DCI would go a long way to check a surge of unprofessional and unskilled clinicians. Flaying the recent allegations levelled by the Rural Health Pharmacists Association (RHPA) that majority of the rural doctors released monthly salary cheques to the pharmacist only after getting Rs 2,000 in cash from each pharmacist, state president of the RMSA Dr Aslam Parvez termed the accusation as baseless and devoid of logic. On July 25, 800 pharmacists associated with rural dispensaries of Punjab had made an attempt to block the passage leading to the house of Rural Development and Panchayat Minister Ranjit Singh Brahmpura in Amritsar. They were protesting that their total monthly package came directly to the accounts of contractual doctors and it became discretion of the doctors to pay pharmacists and class IV out of that. Talking to The Tribune, Dr Aslam said for the past two years, the paramedical staff and pharmacists had been getting salaries directly into their accounts. “Following the instructions of Rural Development and Panchayat Minister Ranjit Singh Brahmpura, Zila Parishads of Punjab are directly transferring the salary of pharmacists and paramedical staff into their accounts,” he said. Dr Aslam said it was decided that paramedical staff and pharmacist would continue to work under the authority of respective rural doctors, but the salary would be given to them by the Zila Parishads directly. “Nowhere in Punjab, doctors are giving any pay cheques to pharmacists/ paramedical staff and allegations levelled by the Pharmacist Association are completely baseless,” claimed Dr Rajwinder Singh, posted at one of the rural dispensary in Patiala. “Since many rural doctors had already left the job due to meagre salary being given to them, pharmacists have started levelling allegations against rural doctors, so that they get further de-motivated and quit their job. By doing so, pharmacists may get the opportunity to run rural dispensaries, as was being the case before 2006, when there were no doctors in rural areas for more than two decades and the dispensaries were run by pharmacists and paramedical staff only,” he claimed. On July 21, the Nangal police arrested two accused for making false police verification certificates for getting passports of people and then sending them to Iran, Iraq, Dubai and other Arabian countries on the basis of those fake certificates. Operating a travel agency named “Saka Consultant”, accused Jaswant Singh from Bhanoupli and Dakhu, alias Raju Shahid, from Bhagat Singh Colony Nangal did not have any licence to work as travel agents. The police seized fake stamps of the SHO, Nangal, besides confiscating 18 passports. With the arrest of these two, the people who had gone abroad on the basis of fake clearances certificates were now feeling insecure. “My son has gone abroad through these travel agents. We are apprehensive about his future now,” said worried father of a youth who recently went abroad for higher studies. Residents alleged the arrested travel agents had, in a way, managed to fleece even the police. “During such circumstances, the role of police should also be brought under the scanner,” localites pointed out. Meanwhile, the police has also seized fake stamps of the SP, Una, the SHO, Haroli police station (Una), and that of the munshi, Haroli. These stamps were also used for churning out fake police clearance certificates. Police officials said the accused had got these computerised stamps made from Kiratpur Sahib. The police has also seized two stamps issued in the name of a company dealing in security guards. “Those seeking jobs as security guards abroad, were given fake experience certificates and issued fake I-cards,” the police said. According to an official release, the Deputy CM was accompanied by state PWD Minister Parminder Singh Dhindsa. The Deputy CM impressed upon the NHAI chairman that there was no entry or exit point in the highway for Ludhiana city right from Doraha to Ladowal. At the meeting, it was agreed to provide one exclusive entry and exit point for the business city of Ludhiana and ensure the completion of this major project by June 2011 positively. A joint committee of the chief general manager, NHAI, Chandigarh, and chief engineer, National Highways, Punjab PWD, was constituted to work out the solution for small obstacles coming in the way of the smooth completion of this project. The meeting also decided to put all four projects with a combined project cost of Rs 4225 crore, including the six-laning of the Panipat Jalandhar Section of NH-1, four-laning of the Jalandhar Dhilwan Section of NH-1, four/six-laning of the Kharar-Ludhiana Section of NH-95 and four-lanning of the Ludhiana-Talwandi Section of NH-95, on fast track ensuring their early completion. An Australian family had preserved an urn containing his remains for the past 63 years, whose descendents too will be accompanying the urn on July 28. 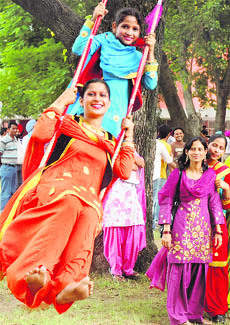 Although Kapil will not be part of ceremonies planned by villagers, they are enthusiastic about the event. Manjeet K Singh of SBS Radio, Australia, which aired the story, and Harmel Uppal, great grandchild of Pooran’s brother Sultani Ram, will also come to the village. Talking to TNS, Hardeep Singh, another great grandchild of Pooran’s brother, said the family had been intimated that Kapil Dev would hand over the ashes to Harmel in New Delhi. “We are waiting for our honored guests who are bringing the remains of our forefather,” said Hardeep. He said an akandh path would be organised in remembrance of their great grandfather. Master Prem Bilga, general secretary of the Baba Bilga Charitable Trust, said that the deceased’s legend had spread like wildfire in the surrounding villages and people would be thronging to pay their last regards in Uppal Bhopa tomorrow. Punjab. The department had invited entries for this one-year IT diploma course, which would be started for a fee of Rs 1,000 per student. This diploma is for students of Class XI, XII and Class XII passouts. District coordinator of Information and Communication Technology MS Sodhi said nearly 400 students from Patiala district had applied for this course. He added during a meeting with Director-General of School Education Krishan Kumar this day, the date for the beginning of this course was fixed as August 2. He said around 20 centres would impart the course in the district. As many as 14 centres have already sent their entries. Computer teachers would take these diploma classes after the school from 2.30 pm to 5.30 pm. Two students would share a computer and if the number of students exceed, the fees of Class XI students would be refunded sp that they could attend the course next year as well. The students will also be given certificates after the completion of the diploma. The court of Additional Sessions Judge, Ropar, Surinder Mohan today granted bail to Russian national Olga Timoshik, who was arrested for being an accomplice of German spy Thomas Kuhn. The court granted bail to Olga on two sureties of Rs 1 lakh each. She was directed to submit her passport to the police, not to leave the country and cooperate in the investigation. Earlier, an Anandpur Sahib court had refused her bail on July 5. Tomorrow, sureties would be submitted in the Anandpur Sahib court, where Olga’s trial has been going on. The Nangal police had arrested her on June 23 from her rented accommodation in Vaishali Nagar, Jaipur. During her hearing at the Anandpur Sahib court on July 1, Olga had flatly refused to recognise German spy Thomas Kuehn. Kuehn had claimed before the police that his passport was with his girlfriend Olga, who took it for renewal, but never returned. Following this, the police conducted a search at Olga’s house and came across incriminating documents wherein details of Thomas Kuehn were fabricated to prepare some documents. Appearing before the Punjab and Haryana High Court, present director Dr JP Singh has, however, assured the court that the cases were being reconsidered. The assertion came on a bunch of petitions by Lakhvir Kaur and others. The petitioners through counsel Rajeev Anand had asserted that the “incumbent director, Health and Family Welfare, Punjab, had cancelled the transfer orders issued by the earlier retiring director, without any application of mind, causing undue hardship to petitioners and others, just after a month of earlier orders”. Referring to a similar matter, Justice Ajai Lamba observed: “Dr JP Singh had “brought to the notice of the court that many transfers have been issued by the retiring director. Without any discrimination, all transfers have been cancelled so as to assess whether these are in administrative exigency or not. “Dr JP Singh had further assured the court that none of the orders has been passed with malafide intention. An assurance was given to the court that the petitioners would be heard and his/her case would be reconsidered considering the administrative exigency. Dr JP Singh had also told the high court that “the earlier director was scheduled to retire and it seems that without considering the administrative exigency ordered the transfers in a hurry”. Before parting with the orders, Justice Lamba took note of the assertion by the counsel for the petitioners that they would be satisfied on reconsideration of their case in view of Dr JP Singh’s declaration, and disposed of the petitions in terms of a similar case - Jasbir Kaur versus the State of Punjab and another. In it, Justice Lamba had ordered maintenance of status quo for six weeks for reconsideration of cases. The accused have been identified as Jasvir Singh, alias Jassi, and Akshey Gupta. A police spokesperson said sub-inspector Bhagwant Singh, in charge CIA, Bahadur Singh Wala, sub inspector Bachittar Singh and havaldar Parminder Singh got this information. He added that both were arrested from Mehlan Chowk with fake currency of Rs 15,00,000. A case has been registered against both at Sangrur police station. The head of the fake currency racket, Jagtar Singh of Shahpur district in Jalandhar, is already in Jalandhar Central Jail. The spokesperson claimed that Jagtar was in touch with Sarvan Rai and Pinky, residents of Bihar. He cheated many by selling fake currency on half its price in various cities through both accused Akshey and Jasvir. The spokesman said Akshey and Jasvir, after deducting their share, used to deposit the balance in Sarvan’s and Pinky’s accounts.